Quick and easy is the name of the game. This Kale Taco Salad is mouthwatering and only takes about five minutes to prep. We’re here to prove that eating healthy does not need to be a huge time commitment and is as easy as 1, 2, 3! As a part of a balanced diet, it is recommended that half of your plate should be filled with vegetables and recipes like this are an excellent way to get that fix. Plus, veggies offer natural vitamins, minerals, and fiber that we need to keep our cells functioning properly. Kale is a leafy green vegetable that belongs to the Brassica family, a group of vegetables including cabbage, collards, and Brussels sprouts that have gained recent widespread attention due to their health-promoting phytonutrients. The kale helps to round out this recipe by providing vitamin K, A, and C, folate, B vitamins, copper, manganese, iron, and even more fiber. The bell peppers add a huge dose of vitamin C as well and can help your body absorb the iron from the kale and beans. Plus beans are a great source of protein. Start off by chopping your kale into small pieces. Pour olive oil and salt into your hands and manually massage it into the kale to break down some of the bitterness and making it easier to chew because it breaks down the fibers. 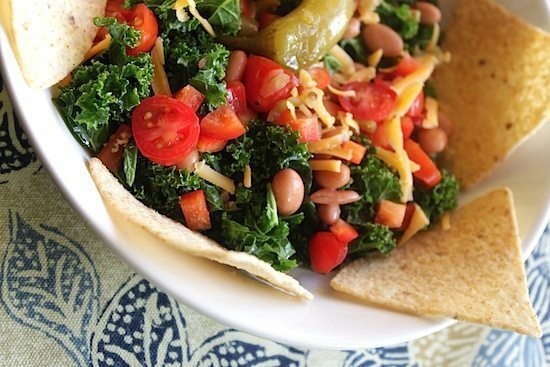 Mix together the kale, red pepper, pinto beans, cherry tomatoes, olives, jalapeno, and tortilla chips. Top with some shredded cheddar cheese for all of you cheese lovers out there. You can get creative with this one too. Add some fresh salsa or avocado slices to customize your salad as you want. What other toppings would you add to this quick and tasty taco salad? Let us know in the comments below! what else would you have with this? I could see serving this at a football game as an appetizer. I think I would need more for an entrée.